It’s Time to learn about BLIND TASTING. This does not mean that only Stevie Wonder can Taste these wines.This is the only sure fire way to end your Brand Name Addiction in less than 5 minutes. When I was a Bartender I as I do now believe that Pinot Gris (Pinot Grigio) from Oregon’s Willamette Valley was much more pleasurable to drink than any Italian Style Pinot Grigio. Of course it is no secret in America the Brand Name in this category is Santa Margherita. This is the #1 Pinot Grigio In America and hated by Italians in Italy and by ALL Restaurant Sommeliers in America but yet they sell it because The Brand commands $12-15 Per GLASS and $48-$54 Per Bottle and the Wholesale cost on the bottle is an average of $12 for the WHOLE Bottle!!! Retailers charge from $18-$24 Per Bottle when GREAT Pinot Grigios can be purchased for $10. Wine Spectator used to Review This Wine scoring it a miserable 70 Points in 1984 to the last vintage they will EVER Review 2006 at 84 Points. My Favorite review by James Suckling was the 2006 Santa Margherita Pinot Grigio was 81 Points with these Words “Has some citrus and honey character. Medium-bodied, with a light finish. NOT MUCH TO THIS WINE!!! Drink now. 165,000 cases made. –JS” When I was a Bartender I had great Pinot Gris from Oregon to offer at 1/2 the price and then the ADDICTS came in and Called Out The Brand Name of course with No Year. I PLEADED with them to use these bags with me at the bar to blind taste 2 Different Pinot Grigios and just simply answer WHICH TASTED BETTER! With MUCH Resistance from the Dining Guest and Brand Name Addict and their Husbands or Girlfriends warning me that I didn’t know who I was dealing with. A Loyal 20 Year Drinker of ONLY Santa Margherita and the Warning Finished, You Are Wasting Your Time. I responded if I am wrong, I am wrong but it would be fun to try. Out came the bags and Four Glasses of Wine but only Two Bottles in Paper Bags like the ones above in The Picture. The Brand Name Addict was fidgety, annoyed, because like any other addict she just wanted her FIX and didn’t want to go through what she thought was NONSENSE!. 100% Of The Time I Poured the same way secretly in the back in the same order with each ADDICT. I warned them that the names of the wines they were drinking were under the glasses on pieces of paper and all 4 glasses could be mixed up or they could be all the same. Again I reminded them, I was not looking for them to guess which one was their SANTA MARGHERITA, just which one did they like the TASTE of the best. From Left to Right In the back I poured the first 3 glasses ALL Santa Margherita with the last one being an Oregon Pinot Gris. In those Days I had 2007 King Estate Oregon Pinot Gris and Bridgeview Blue Moon Pinot Gris from Oregon as well but I used the 2007 King Estate. The first glass the guest tasted, 100% of the time they would make a face of a person having a Seizure and Yell “UGGGH UGGHH, this is Horrific and Sour, Do We Have To Do This Stupid GAME?” Can’t I just get a Stinkin’ Glass Of Santa Margherita?? (Addict wanting her Drug). I Replied “Calm down. Only 3 more glasses to go. We will just mark down that you Despised the First Glass” Number 2 Glass the guest would respond 100% of the Time “This one is a little bit better but still not my favorite” Number 3 The Guest would say: “So far, I like this one the best cause it probably is my Santa Margherita” I reminded them one last time. We are not trying to figure out which is Santa Margherita but which is YOUR FAVORITE TASTING PINOT GRIS/PINOT GRIGIO). The Last and Final Glass and the guest 100% of the time would say ” Wow, this is so smooth. This is the perfect Pinot Grigio. Then Ta Dah!!!! I Would reveal what they tasted. The first one that you had a Seizure and almost couldn’t swallow was the 2006 Santa Margherita and so Were the next 2 Glasses from the very same bottle. The Last one that you thought was DELICIOUS and had the Best TASTE was 2007 King Estate Pinot Gris from Oregon and is only $8.00 per glass not $15.00 Per Glass. I wish I had an I-Phone back then to snap pictures of the Jaw Dropping Faces of these now RECOVERING BRAND NAME ADDICTS. I Still do this in 2013 with many other Brands who will remain nameless in order to Protect The Innocent. This a not a mixed result folks. 100% of the time when tasted with these bags and the PSYCHOLOGY of Brand Name Addiction is REMOVED from the tasting, The Guest always prefers the Wine which is different than the One they Originally THOUGHT was their Favorite. THE HELP IS OUT THERE FOLKS. I Am Here To Help. Your Family And Friends Are Here To Help….But you must take The First Step and ADMIT YOU HAVE AN ADDICTION!! Having been a branding designer for many years I can say that “brand recognition” is what marketers bank on and as consumers we are conditioned. 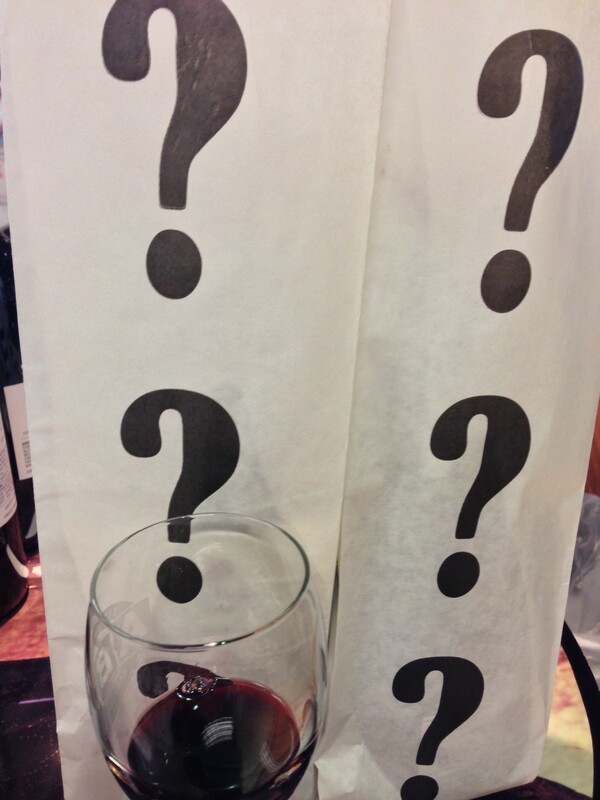 But, duh….with wine there are far too many variables to have consistency from year to year! Seems like a no brainer to me! PreviousPINOT TRIO! Have It Your Way!